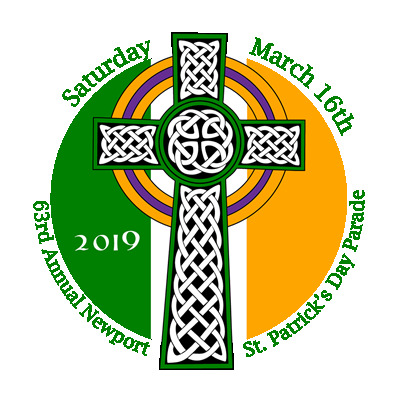 The 63rd Annual Newport, Rhode Island Saint Patrick's Day Parade will be held, rain, snow, or shine, on Saturday, March 16th 2019. It will begin promptly at 11:00am from Newport City Hall and will proceed to Carroll Avenue at Saint Augustin’s Church in the heart of the Fifth Ward. The parade this year is estimated to last 2 hours and will include Pipe Bands, Marching Bands, Fife & Drum Corps, Clown Units, reenactment units, and a host of local, state, and regional organizations including police and fire units, social/fraternal organizations, Boy Scouts, Girl Scouts, Schools, and non-profits. Every year we honor two individuals. A Grand Marshal and a Dedicant. This year our parade is dedicated to Leonard T. Murphy (1936 – 2018) and the Grand Marshal is Robert Lehane. Our yearly button designs try to incorporate the vocation or interests of our Grand Marshal. For the 2019 Saint Patrick’s Day Parade our Grand Marshal is Robert "Bobby" Lehane.